If you’re looking for a special diamond ring for yourself or someone you love, you may have considered choosing a piece that has Celtic design elements. The best Celtic rings, featuring inlaid diamonds or solitaire stones, will also offer some charming motifs that really evoke the spirit of Celtic culture. Some common symbols that appear on today’s diamond rings are Claddagh crowned hearts (held by two tiny hands) or Trinity Love Knots, which symbolize the Holy Trinity. Love, romance, and faith are the keystones of Celtic symbolism. Some of the symbols are so ancient, they can be traced back to the times of the Druids. When Ireland, Scotland, and Wales converted to Christianity, the old Pagan symbols evolved and soon carried new meanings. While symbols such as the Claddagh heart and hands are newer, they are by no means modern. The first Claddagh Ring was created to honor love that cannot change or die. This sense of faith in the Ideal is a touching component of the Celtic spirit. We’ve compiled a list of beautiful Celtic diamond rings, in order to show you just how the centuries-old tradition of expert Celtic metal work continues today. The artisans of Ireland devote themselves to crafting new styles that feature the same painstaking, handcrafted quality as the treasures of old. Heirloom quality and mystical touches add depth and wonder to the diamond rings of today. The first ring we are featuring is truly one of the most classic, timeless designs you will find. Its gentle Trinity Knots, with their intricate curves, are the perfect backdrop for a superior diamond, faceted into a classic square shape. This diamond also offers two-tone beauty, through the use of yellow and white gold, which greatly increases the visual impact of the design. As well, choosing a Celtic engagement ringwith two tones of precious gold will allow for more versatility.A woman will be able to wear silver or gold rings and bracelets, as well as wristwatches, and everything will still coordinate.Another stellar choice for today’s woman is the bold, individual style featured at the top of our blog. 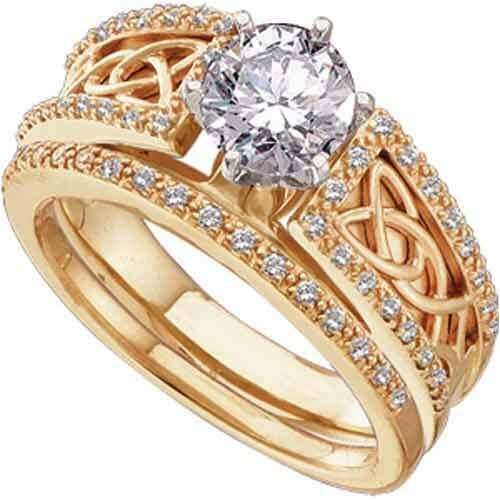 Delicate Celtic interlace is set into the wide band, which features a modern, round diamond center. This ring will never seem commonplace. The creativity of the design is meant to add a touch of artistry and beauty to a woman’s life. Since an engagement ring will be worn every day, it should be perfect for the woman who wears it. If you love strong shapes and original details, this Celtic ring could be the one for you. Our last ring is a Claddagh engagement ring that is utterly gorgeous. No bride-to-be could resist the romantic touch of a heart-shaped diamond, with its signature crown (symbolizing loyalty). The diamond is held by the two tiny hands that are loving, protective, and tender. This ring is gorgeous in yellow gold. The handcrafted splendor of the Claddagh symbols are something to marvel at. If you’re looking for an heirloom-quality ring that can be enjoyed for generations, go traditional with this Claddagh engagement ring. In Irish families, Claddagh rings are often passed down on a child’s wedding day. You can start this touching tradition with your new Claddagh engagement ring. This entry was posted in Antique engagement rings, Diamond rings, Gold engagement rings, Vintage engagement rings, Wedding engagement rings and tagged celtic culture, celtic design, celtic engagement rings, celtic rings, celtic spirit, celtic symbolism, diamond rings, heart and hands, keystones, precious gold on September 4, 2009 by Donald.